The unemployment rate for Hispanics in the U.S. has returned to a historic low last seen more than a decade ago, though other labor market measures show this group has not totally recovered from the Great Recession, according to a Pew Research Center analysis of government data. This improvement extends to Hispanic women and men, as well as U.S.-born and foreign-born Hispanics. All four groups now have unemployment rates that are at or below their pre-recession levels. Hispanics born in the U.S. have made the most progress on this measure, with the group’s unemployment rate dropping to below its pre-recession level – 5.6% in the second quarter of 2017, compared with 6.2% in 2006. By comparison, foreign-born Hispanics’ unemployment rate in 2017 (3.8%) had only returned to its pre-recession level. Hispanics make up 17% of the U.S. labor force in 2017, up from 13.5% in 2006. Much of this growth comes from U.S.-born Hispanics, who make up 52.5% of the Hispanic labor force in 2017, compared with 44.1% in 2006. 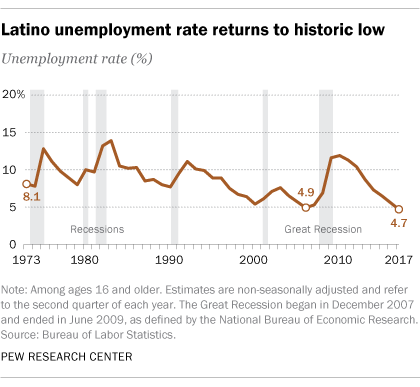 Despite the declining Latino unemployment rate, two other measures of labor market activity – labor force participation and the employment-population ratio – reveal that Latinos in the U.S. have not totally recovered from the Great Recession. This, too, reflects the experience of American workers overall. The labor force participation rate for Latinos stood at 66.1% in the second quarter of 2017, well below its level in the second quarter of 2006. The employment-population ratio for Latinos also has yet to fully recover, standing at 63.0% in 2017, or nearly 3 percentage points below its 2006 level. Among workers in the U.S. overall, the labor force participation rate (62.9%) and the employment rate (60.3%) in 2017 also are about 3 percentage points below pre-recession levels. These labor market measures also show that, at least in terms of employment, the economic recovery among Hispanics is further along for women than it is for men. Among Hispanic women, the labor force participation rate (56.4%) and employment-population ratio (53.2%) in 2017 stood at similar levels as in 2006. Among Hispanic men, the current labor force participation rate (76.0%) and employment-population ratio (72.9%) are nearly 5 percentage points below their respective levels in 2006. U.S.-born Latinos have fared better than foreign-born Latinos in their economic recovery. The employment-population ratio of U.S.-born Latinos in the second quarter of 2017 (60.8%) had nearly returned to pre-recession level, but for foreign-born Latinos the ratio remained more than 3 percentage points below 2006 levels, at 65.9%. Latino women and U.S.-born Latinos have seen their standing in the labor market improve more than Latino men and foreign-born Latinos, in part because they are more likely to work in industries that have added the most jobs since the Great Recession, namely social assistance, education, health care and accommodation and food services. In 2006, 37.6% of Latino women were employed in these four industries, compared with only 14.6% of Latino men. Similarly, 26.8% of U.S.-born Latinos worked in these industries in 2006, compared with 21.3% of foreign-born Latinos. Conversely, Latino men and foreign-born Latinos were more likely to work in the three industries that have shed jobs since 2006 – information, construction and manufacturing. In addition to the ongoing recovery in the labor market, new data by the U.S. Census Bureau reveal strong gains in Latino household income in recent years, up 10.7% from 2014 to 2016. Also, the poverty rate for Hispanics decreased to a record low of 19.4% in 2016. (However, Latinos have a higher poverty rate and lower median household income than the households overall.) These developments are reflected in Latinos’ confidence in their economic situation. Since the Great Recession, Latinos have grown more confident in their personal finances and more optimistic about their financial future, according to Pew Research Center surveys.